Twenty one years ago, today, 600 Policemen were murdered in Eastern Sri Lanka in cold blood by the LTTE, on being ordered by the Political Executive of those times to surrender to them. This manifestation of LTTE savagery, coupled with the stunning opportunism and naivete on the part of Sri Lanka’s political leadership of those times is referred to by Senior-Superintendent of Police (Rtd) Tassie Seneviratne as the ‘Saddest Day in Police History’, in his recently published book ‘Human Rights and Policing - Reminiscences of My Police Days’. The biggest tragedy that the Police had ever suffered was the massacre of over 600 Policemen who surrendered to the LTTE in obedience to orders from the Executive President of Sri Lanka. President Premadasa was overly keen to impress the international community by drawing Prabhakaran to the negotiating table. In a vulgar haste for personal glory, he was blinded to all lessons learnt from Prabhakaran’s repeated intransigence, and the fate that awaited the Policemen who were gallantly withstanding the terrorists’ onslaught. Ordering the Police to ceasefire would have been understandable provided the ceasefire was mutual. But to have given specific orders to the Police to comply with the terrorists’ demand to lay down arms and allow the terrorists to transport the Policemen to Ampara Police in vehicles controlled by the terrorists, was the height of stupidity, and to have expected safe passage for the Policemen, was the height of optimism. It was nothing short of a live offering of the gallant Policemen, just to prove to Prabhakaran the extent to which President Premadasa trusted him. With his trusted peace negotiator, Minister ACS Hameed monitoring this entire episode and co-ordinating proceedings, the IGP was left with no discretion but to comply with the President’s order to carry out instructions as conveyed to him by Minister Hameed. It has also been revealed that a couple of months prior to his order to the IGP asking the Police to surrender, a large quantity of arms and ammunition had been issued to the LTTE by the Sri Lanka Army on the orders of President Premadasa, to fight the IPKF. These weapons were used against the Sri Lanka Army when war broke out in June 1990. 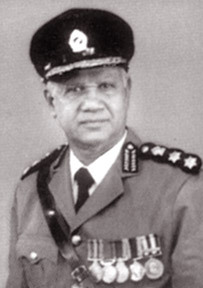 Bradman Weerakoon who was Prime Minister Premadasa’s Secretary for four years prior to his appointment as Presidential Advisor on International Affairs since mid-1989, has gone on record saying that he and the officials around President Premadasa were very much in the dark about the whole affair relating to the delivery of the arms and ammunition (Rendering unto Caesar - p 287). He also displays ignorance of the fact that it was President Premadasa who ordered the Police to surrender, and attributes the decision to IGP Ernest Perera. (Rendering unto Caesar - p 290). These two debacles alone point to the dishonesty with which President Premadasa had been acting, going to the extent of even sacrificing the lives of soldiers and Policemen, just to convince Prabhakaran of his trust. It is clear that he had been planning to deny the fact that he gave the orders, when things backfired, and hence kept his much trusted advisor on international affairs and other officials around him completely in the dark and, deny he did when the inevitable took place. Strenuous attempts are still being made to whitewash President Premadasa’s heartless action and the subsequent cover-up attempts by the stooges around him; but the truth must prevail. On September 3, 1991, a Special Supplement was published for the 125th Anniversary celebrations of the Police. I wrote an account of this tragedy for the Supplement. Chairman of the Organizing Committee, Senior DIG Frank de Silva and the Editor of the Supplement, Senior DIG Merril Gooneratne, at first required the approval of the IGP to publish my article. I thereupon took it to the IGP Ernest Perera. Having read through the article, the IGP passed it as a factually correct account of events that took place and had no objection to it being published. Still for all, the article was not carried in the Supplement. It speaks to the sense of fear exuded by President Premadasa over the people including senior officials. Subsequently I released it to the media. Seeds of Political Terrorism were sown in Sri Lanka since 1975. By 1987 Provinces of the North and East were engulfed by Terrorist violence. As many as ten Terrorist groups took to arms against the government to fight for a separate State of Eelam. The Liberation Tigers of Tamil Eelam (LTTE) was the most powerful and ruthless of these groups. Police stations became the main target and with the sophisticated heavy arms the terrorists had acquired, Policemen became sitting ducks. This resulted in too many Policemen showing reluctance to serve in the North and East. To overcome this problem, North and East were declared operational areas and a special allowance was paid as an incentive to officers serving in these areas. This however was not commensurate with the risk to life, and the reluctance to serve in operational areas remained a problem. A policy of compulsory service in operational areas was next formulated to overcome the problem. Furthermore, units of the Army and, the Special Task Force (STF) which is the elite Commando Unit of the Police Force, were placed at or near vulnerable Police Stations to assist the Police in their defences. In January 1989 Prime Minister Ranasinghe Premadasa rose to Executive Presidency pledging to solve the ethnic problem through consultation, compromise and consensus. Resolutely he kept inviting all parties and groups for peace talks. In April 1989, the LTTE accepted the President’s call and peace talks commenced between the government and the LTTE. The government was sincere in its peace offer and instructed the Police and the Armed Services in the North and East to avoid confrontations with the LTTE. Army and STF Units, which were located at or near Police Stations to assist the Police in their defences, were withdrawn as part of the peace package. Groups of Liberation Tigers however committed acts of provocation against the Security Forces. These provocations, though humiliating, had to be tolerated by the Security Forces and in several cases the provocations grew in intensity to wrongful restraint, wrongful confinement, abduction and hurt. “No confrontation at any cost”, remained the command, on the understanding that the LTTE Leadership would sort out matters. The LTTE was given a chance to bring its cadres, who were hitherto fighting from the jungles, under some sort of discipline. These Tiger groups thereby got away with their provocations with impunity and gained a preponderance over the security forces who of course had no doubt about the Tiger intentions. Thus the LTTE built up their army - They built bunkers and collected all the logistical needs for war. Bunkers were built even within firing range of security establishments - the excuse being, to defend themselves if attacked! On June 11, 1990 while peace talks were still in progress in Colombo, and the STF was providing security to the LTTE housed in five star hotels, Police Stations in the East were surrounded by armed cadres of the LTTE who ordered the Policemen under threat of death to surrender their arms and vacate the Police Stations. The duteous Policemen found themselves on the horns of a dilemma. Ivan Boteju, ASP Kalmunai, who by this time had long completed his compulsory spell in the operational area, had volunteered to carry on as no one was willing to take his place. It was only in November 1989 that he and his men faced a severe attack from the Tamil National Army (TNA) with mortars, rocket propelled grenades and automatic weapons. In that attack which lasted from 17th to 23rd November, 06 soldiers from the Army unit which augmented the Police defence were killed and several Policemen injured. Ivan Boteju and his men however had fought back gallantly and repulsed that attack. And now they had to face this new and paradoxical situation. I van Boteju contacted his superiors for orders and in the meantime ordered his men to take up positions to defend the Police Stations if attacked. The LTTE leaders however, convinced the Government in Colombo that it is a misunderstanding, and gave an assurance that it will be sorted out. The Government trusted the LTTE Leadership. “No confrontation” remained the command. Passing the deadline of 1500 hrs the LTTE commenced attacking Kalmunai Police Station and the Policemen returned fire in defence. Volleys of fire and defiant words were exchanged for three and a half hours. At this stage the LTTE hierarchy giving an assurance to the Government that all Policemen of Kalmunai, Akkaraipattu and Pothuvil will be taken to Amparai and released, wanted the Policemen to surrender. The Government was prepared to sacrifice its arms and equipment and the Policemen were ordered to comply with this proposition. Ivan Boteju and his men however were not willing to surrender and protested insisting that they “would be tortured if not killed” and opting to face the LTTE attack requested Air support and Military cover. “No confrontation” remained the orders of the President, personally conveyed by the IG Police who was flown to the East with the specific orders from H E the President. Ivan Boteju, an athletic great of the fifties, smart and always spick and span, walked from the Police Station with his men - this time his head hanging low, unbuttoned shirt hanging out, sobbing and obeying. By way of deception the LTTE Tigers took 324 Policemen to the Tirukkovil jungles instead of Amparai, blindfolded them, tied their hands to their backs, got them to lie down facing the ground and massacred them in a most cowardly manner, spraying bullets into them. In this connection SP Amparai M F Noordeen has placed on record inter alia thus: “.... At 1530 hrs contacted S/DIG Crimes and Ops and briefed about the prevailing situation in Kalmunai and sought instructions whether to evacuate Kalmunai also. I was told that instructions will follow. At 1555 hrs the LTTE started attacking Kalmunai Police Station with mortars. All efforts to obtain air support and artillery support failed up to 1720 hrs. At this time IG Police spoke to me from Batticaloa and ordered to stop firing, and officers of Kalmunai to surrender to the LTTE like at Kalawanchikudi. Though no professed advocate of Human Rights has so far protested on behalf of the Policemen, an old Tamil farmer who had seen the whole carnage strongly disapproves of what the Tigers did. I met this good man and he related to me the ghastly story. He concluded the story swearing that god Muruga (god Kataragama) is greatly disturbed and will avenge the inhuman massacre of those forlorn human beings. Many a cynic, now with hind-sight, speaks of several options that were available to the Policemen. What has to be appreciated is that in spite of their own apprehensions, Ivan Boteju and the Policemen of Kalmunai gave their whole hearted co-operation to the government which pledged to find a peaceful solution. The Government demonstrated its TRUST in the Tigers as TRUST was believed to be an essential commodity towards a peaceful solution of the ethnic conflict. This however was at the expense of the lives of the Policemen, and that is the charge. Over another 300 policemen were similarly abducted from Batticaloa and Vavuniya Districts after they surrendered on orders and were similarly massacred. June 11, 1990 would go on record as the saddest day in the history of the Sri Lanka Police Force as we celebrate its 125th anniversary on this 3rd day of September 1991.